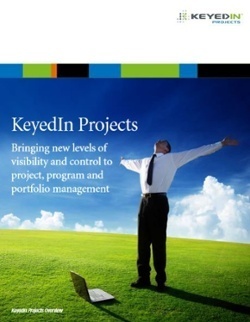 Download this brochure to learn how KeyedIn Projects has helped organizations alleviate PPM and PMO challenges with comprehensive project and portfolio management software that increases efficiency and improves overall PMO success. Work Smarter. Not Harder with KeyedIn. From product launches to process re-engineering, IT implementation to internal transformation, as well as delivering services and solutions to customers, organizations in all fields increasingly embrace the discipline of project-based working. KeyedIn provides a means of managing resource, monitoring progress and quantifying success... but only when applied diligently and intelligently – in a way that gives project managers the tools they need, and provides senior decision makers with the information they require. But simultaneously delivers the rich management information needed to support effective program and portfolio management. View the Brochure by filling out the form above.